I recently purchased a Shibaura D23F tractor with a front-end loader attachment. The control valve that operates the front-end loader is cracked just above the port labeled “T” on the valve block. When the 3pt hitch is raised to the top limit, there is a geyser of hydraulic fluid that spays from the cracked valve. I am not experienced with hydraulics but from what I have researched this is what I can share. The hydraulic pump is mounted to the engine. The output of the pump is directed through a ½” metal line for 10-12 inches before it converts to a rubber hydraulic line. This rubber line then connects to what I can determine is a 2-spool valve with two levers controlling the bucket and loader arms. The rubber line connects to a port located on the side labeled “P”. 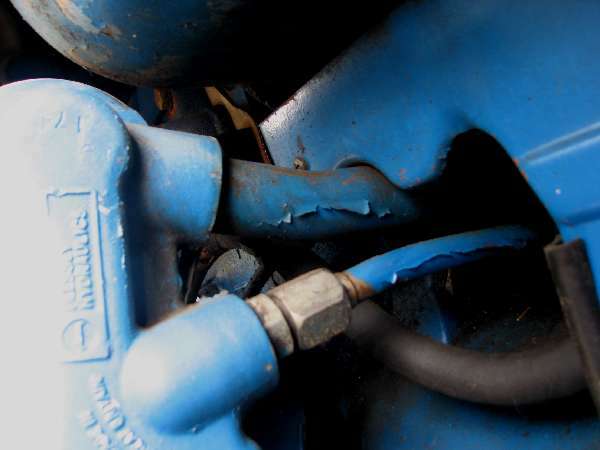 There is another rubber hydraulic line that exits the control valve from a port label “T” and extends for a couple of feet before connecting to the metal line that returns to the transfer case under the tractor seat. The 4 lines supplying the cylinders for the FEL connect to fittings between “P” and “T” ports. Stamped on the back of the block valve is: "1500 15"
The 3 point hitch controls are located to the right side of the tractor seat. The controls appear to have been modified into a “hybrid” configuration. There is a flat-bar lever that pivots on a single bolt. To this flat bar is another bracket that I would describe as having a right angle at each end that wraps inward. These right angle tabs make contact to what appears to be control valves and are manipulated in/out as the flat-bar lever for the hitch is moved up/down. The control valves also appear to be solenoid valves by the evidence of wiring harnesses that were “cut” sometime in the past. I have drained the hydraulic fluid, which was clean. I have removed the internal suction line screen and cleaned minimal material from the magnets. I have also replaced the external hydraulic filter. The replacement of the control valve for the FEL appears to be a straight-forward process. However, I would like to know that when I replace this valve, there is not a remaining condition that would cause the replacement valve to malfunction or break. I have a D23F and have an issue with the lift arms on the three point. As with yours, the complicated electronic box fitted on the right side has been removed. Lift and lower are controlled by an 'on-of-on' switch which operates both solenoids. My problem is that the arms lift in three stages which can almost be timed. The arms reach top and the hydraulics go to 'constant pump' then a relief valve cuts in. I am of the opinion there is a blockage in system. You mentioned you had removed the internal suction line screen and cleaned minimal material from the magnets. Where do I locate the internal suction line screen? As to the first post. The most common reason for a crack would be deadheading. If the hoses to the loader have quick disconnects & the hydraulic line after the valve is disconnected, there is no path for the oil to go. this creates more pressure than system is designed for. Usually it cracks the hydraulic pump or blows the seals. This is an open center system so it requires an open center valve. I can supply you with a compact tractor valve.My email is on the attached website. As to the first post. Where suction line attaches to rearebd housing. Remove 3 bolts. screen is attached to plate.